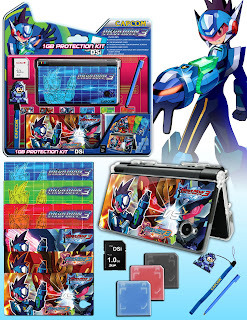 "The DSi kit comes with Limited Edition MegaMan Laser enscribed PolyCarbonite Console Case w/ secret 3 Game Storage Shelf, Graphic Screens, Three 2-in-1 SD Card and Game Cases, Precision Stylus, 2-in-1 Screen Cleaner Wrist Strap with Retro 8-Bit MegaMan + 1GB SD MEMORY CARD." A DS Lite version is planned to be included in a special bundle at Capcom's online store. For those who don't win the contest, the kit will ship to stores on June 16th for $19.99. That's a nice kit! Bonus points to Capcom for not making it a hard-to-remove sticker set. That would be really cool if I had a fraction of artistic talent. Wow, no "Star Force sux lol" comments? Amazing. In any case, wow... I actually want this. And it's only $20? Consider me sold. I'll eventually need an SD Card for my DSi anyway. Can't wait for Star Force 3! Cool but I dont want it. It is just a kit, nah. Well, a $20 prize isn't that much motivation, but on the flip side, for what all you get, $20 is a steal for that set. I want it. Now I wish I had a DSi! Well, this motivated me to finish my entry. Can't decide between the DSi Version or the DS Lite Version >.> I love the "Vs." design. Design is nice though I'm not a RnR fan. I might get the DS lite ver only for the Wrist strap. Yes, I just want the strap. Good thing I have 3 nephews who like RnR that might want the rest of the stuff, minus the memory cards. So now we know what that DS Card thing was that we saw for sale later this month listed on GameStop's website. This looks pretty neat - awesome stuff! I don't have a DS Lite (I have the original DS) and I don't have the money so I'll have to trade in some games and see what I can do. Definitely want this for when I can get a Lite or DSi.